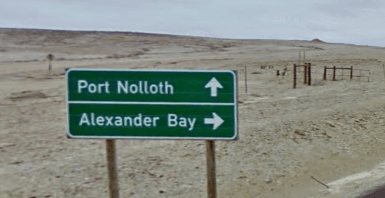 Alexander Bay is located on the R308 driving north from Port Nolloth on the way to Sanddrift. Alexander Bay is a town in the extreme north-west of South Africa. It is located on the southern bank of the Orange River mouth. The Orange river enters the Atlantic ocean at Alexander bay and forms the border between Namibia and South Africa. There is nothing more northerly than this seaside town. Virtually on the border with Namibia in a region known simply as Little Namaqualand. This town organizes historic diamond tours and markets itself as the ‘Diamond Coast – forever Namaqualand’. With diamonds being discovered along the West Coast in 1925, Alexander Bay was established to service the mining industry. The town falls under Richtersveld Local Municipality and is part of Namakwa District Municipality in the Northern Cape.